A few weeks before the trade deadline a year ago, the Cubs acquired Aroldis Chapman, a star reliever who would spend one-third of a regular season and one full postseason in Chicago before hitting free agency. Earlier this month, the Diamondbacks acquired J.D. 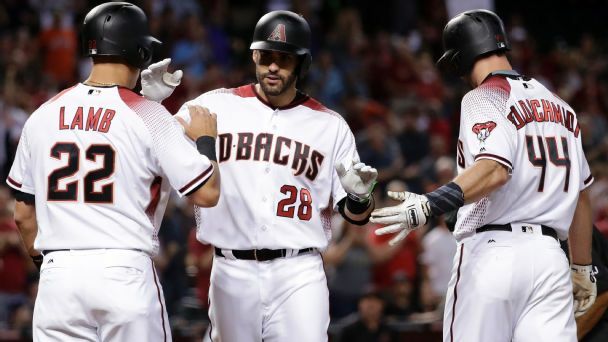 Martinez, a star outfielder who will spend one-third of a regular season and (most likely) one full postseason in Arizona before hitting free agency. The way we ordinarily assess major leaguers -- by their WAR, for instance, or their projected WAR or even by how much a major league team is willing to pay them to play baseball -- Martinez and Chapman are comparable. Chapman signed an $86 million contract last offseason; Martinez looks poised to get roughly that much. They are of roughly equal value. This is truly basic analysis, but it's basically true analysis. The Cubs gave up far, far more in trade to get Chapman than the Diamondbacks did to get Martinez. The Cubs gave up one of the 10 best prospects in baseball; the Diamondbacks gave up one of the 10 best prospects in the Diamondbacks system, perhaps. It follows, then, that either the Cubs got suckered or the Diamondbacks got a steal, and the Yankees were brilliant or the Tigers blew it. Maybe to all of that. I'm here to warn you against declaring suckers and bargains at the trade deadline. The trade deadline is a borderline irrational marketplace that defies the sort of precision analysis we typically apply to transactions. What makes the July market so bonkers? 1. Supply and demand fluctuate wildly from year to year -- or even week to week. Unlike the offseason, when the vast majority of teams are trying to improve in a general and immediate sense, trade deadline teams' incentives are narrowly tailored to the standings, and their rosters are largely already set. Meanwhile, there isn't a batch of dozens of free agents to choose from; there is a small handful of players available from out-of-it teams. As Dave Cameron wrote for FanGraphs after the Martinez deal, this month there just weren't any teams with a big enough need to bid against the Diamondbacks. You can basically go through every contender in baseball and not really find another team like the Diamondbacks. They're the only team who had the obvious corner-outfield need and the incentive to upgrade for the rest of 2017. Other teams were probably interested, but likely not interested enough to really push that hard for Martinez. The other side of pricing is, of course, supply. And while there don't seem to be that many teams buying corner-outfield rentals, there are a bunch of teams selling them. Compare that to the 2014 trade deadline, when Boston was shopping Andrew Miller, who had recently broken out as a top setup man in his final season before free agency. There were no other premium relievers available on the market that week, and according to Boston GM Ben Cherington, every contender in baseball called about Miller. The result: Boston got back a top-100 pitching prospect (Eduardo Rodriguez) in a move that Keith Law called "the best value move of the day," bumming out Orioles partisans. 2. One trading partner might be more motivated to make a deal than the other. In the offseason, even a rebuilding team can justify keeping its players, knowing that they'll have another chance to cash in at the trade deadline (and that they might sell some season tickets in the meantime). But the Tigers, pretty much out of contention and about to see Martinez hit free agency, had almost no choice but to move him. They could have tried waiting to see if another buyer emerged -- either because another team got hot and played itself into contention or because an established contender was hit by an injury -- but they couldn't really not trade Martinez. The only leverage they had over the Diamondbacks was to bluff; otherwise, the Diamondbacks had much more power to set the price. 3. Not all buyers have the same reasons to buy. The vast majority of teams go into an offseason hoping to win their division, not sure (beyond a range of 10 or 15 or so victories) how many games they'll end up winning and not sure how many victories will be necessary. With this broad uncertainty, every win added is valuable. More important, every additional win is equally valuable for all competitive teams. Their goals for the offseason are all more or less the same: Get good players to win as many games as possible. The trade deadline, though, comes when two-thirds of the season is finished, and a lot of the standings are baked firm. For a team such as the Royals, one or two wins could be the difference between winning a division and missing the playoffs entirely, a difference that could mean tens of millions of dollars in revenue and a dramatically different mood all offseason. But for a team such as the Astros, up by 17 games in the AL West, even 15 extra wins probably change absolutely nothing. The Royals, then, would theoretically be rational if they put a much higher value on a veteran upgrade than the Astros would. Or wait! Maybe it's the opposite. The Astros know that they'll be playing in the American League Division Series. They know that they have a reasonable chance of winning a World Series and that whomever they add will be playing incredibly important games. The Royals, meanwhile, might need upgrades to stay alive in this race -- but even if they stay alive, they might not make it to the postseason, and even if they make it to the postseason, it might be for only one game. If the point is to win or get close to a World Series, there's a much better chance that a Royals trade would turn out to be for nothing. Which is to say that the incentives are complicated, and every contending team has its own variables that change every day: how close they are to the division title, how close they are to a wild card, how much they value home-field advantage in a possible wild-card game, how strong their outlook is after this season. In the offseason, 15 teams might look at J.D. Martinez and value him close to equally. That isn't true 100 games into a season. 4. July standings rev up rivalries. With fewer teams in contention, with less ambiguity about which teams you're battling, with probable playoff matchups foreseeable and with a small number of teams looking to upgrade at any position, it's easier in July to see an acquisition as also obstructing a direct competitor's pursuit. A player's value to a team could be, in the right circumstances, just about doubled. This was certainly part of what made the Yankees' acquisition last week of third baseman Todd Frazier and relievers David Robertson and Tommy Kahnle such a coup in their pursuit of the division-leading Red Sox: Those are "three players who could have helped address the Red Sox's two most glaring needs," as ESPN's Scott Lauber put it, and Frazier in particular was probably the last true third baseman on the trade market. 5. The playoffs are a whole new ballgame. At this point last year, Cleveland had a comfortable lead in its division and a 97 percent chance of making the playoffs, according to Baseball Prospectus. With such an easy path to October, giving up two top prospects for Andrew Miller -- now a bona fide relief ace -- didn't mean much for the rest of the regular season. (They won their division by eight games.) But the Indians knew that when the postseason came around, they would be able to guarantee that Miller would be on the mound in some of the biggest moments of their season. The difference between acquiring him and not acquiring him would be dramatic; a World Series appearance might ride on a single at-bat Miller could be held back for. This is not true for the Diamondbacks and Martinez. He'll bat when his turn in the lineup comes up. The closer to the postseason we get, the more it might make sense to invest in October-specific value rather than an April-to-September roster. 6. Clubhouse chemistry is complicated. The conventional wisdom around baseball these days is that good clubhouse chemistry is desirable and important but hard to engineer or anticipate or even assess. This is all amplified for a player added midseason, who joins a team that already has its culture, its narrative arc, its pregame music routines and its post-hit celebration memes. The player added midseason doesn't go through the team-building rituals of spring training. And the player added midseason joins a team that, mostly likely, has had success. If that success suddenly evaporates, he is the new variable who might well be blamed. See, for instance, the panic that grew throughout the summer of 2014 after the A's traded Yoenis Cespedes for Jon Lester and went 22-33 thereafter. It wasn't Lester who was blamed, but the trade took on totemic significance in the collapse narrative -- a narrative even the players bought into. 7. The future is unwritten. The Cubs this month traded for Jose Quintana. As all players' are, Quintana's next few months and next few years are unpredictable. When Baseball Prospectus used its PECOTA projections to forecast him before the season, for instance, it figured that he was a three-WAR pitcher, but it also allowed that there was a 10 percent chance he'd be a five-WAR pitcher and a 10 percent chance he'd be a one-WAR pitcher. Knowing everything we knew about Quintana, we couldn't really rule out that he'd be on Cy Young ballots, and we couldn't rule out that he'd pitch like a lousy fifth starter. That is a scale of uncertainty we can handle, though. The headline name the Cubs gave up for Quintana exists in a world of uncertainty that could make or break a franchise. Eloy Jimenez was the 14th-best prospect in baseball coming into the season, according to Baseball America. Carlos Beltran was once the 14th-best prospect in baseball, and he turned into a superstar who might make the Hall of Fame. Drew Henson was once the 14th-best prospect in baseball, and he retired with one major league hit. If the range of Jose Quintana outcomes spans, say, 10 WAR over the final two and a half years of his current contract, the range of Eloy Jimenez outcomes over the next seven years might be 30 or 40 WAR. To declare a winner or loser based on a player who might turn into Carlos Beltran or might turn into Drew Henson -- with absolutely no clue yet which -- is bold. This is true even of the non-headline names. When Cleveland traded Jake Westbrook in a three-way deadline deal in 2010, it got back a fringy Double-A pitcher who had a career 4.29 ERA across the Padres' minor league system and was barely even mentioned in the next day's newspaper articles. Four years later, he won the Cy Young Award, and two years after that, he pitched the Indians to Game 7 of the World Series. He's Corey Kluber, he was the best player traded that summer, and it radically altered two franchises. Of course, none of this means we can't analyze a trade. Better prospects -- such as the ones the Yankees got for Chapman -- are better than lesser prospects. Diamondbacks fans can be pleasantly surprised that they got Martinez for so little, and Tigers fans can be disappointed that their GM didn't find a more robust market for such an excellent player. But it's never harder than it is in July to call a GM a genius or a fool, and it's never harder to anticipate who we'll say "won" a trade when we look back 10 years from now.